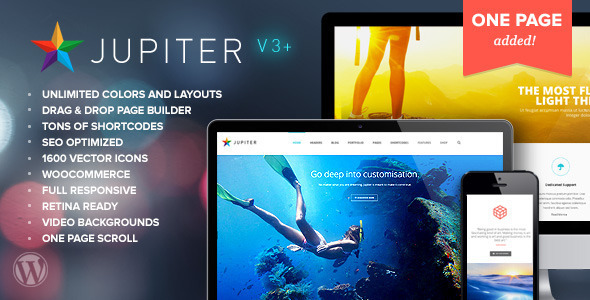 Jupiter 3.9.3 newest version : Released on May 22nd, 2014. There is no limit to what you can accomplish using Jupiter. Add countless shortcodes from Slideshows to new blog layouts within a powerful drag and drop Page Composer. Modify options and settings via Jupiter’s robust Admin Panel. Change your site colors and control your layout with point and click options. Choose from different layouts and templates on a page-by-page basis or Start creating a whole new layout.